The ferry operates for most of the day; a single vessel making the crossing every half hour or so. It has been in operation for only a few years and is a very useful service. If it weren't for the ferry for example, we would have to drive at least 40 miles to get home, instead of only four or five. With a car like ours .......! As we leave the harbour, a loud scraping noise from below combined with an ominous shudder and some watered down curses tell us that the submerged part of the Irish navy is not as healthy any more as U-boat Willie had every right to expect, what with all those inspections and all. 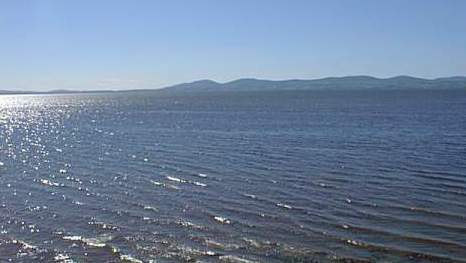 Fifteen minutes later we land safely at Magilligan point. Some of the passengers report that they saw the trail of a vengeful torpedo following us, which suddenly changed course after colliding with a small floating object. We roll off our ferry and take a quick look at the recently renovated Martello Tower. If you haven't followed the earlier link to this remarkably well preserved building, now is your chance. 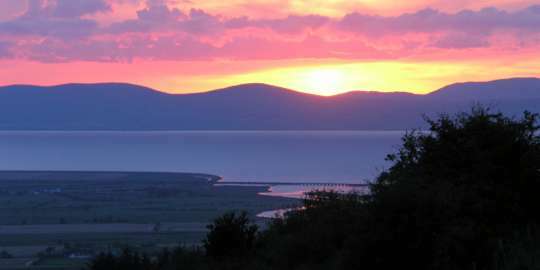 After a last glance across the glittering expanse of Lough Foyle we head for Seacoast Road. 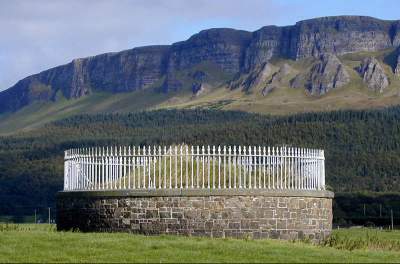 Benevenagh - the mountain that so magnificently dominates this part of the valley - looms ahead. Why Seacoast Road is not just called Coast Road is a mystery. To my certain knowledge there isn't another geographical feature around here likely to be in possession both of a coast and a road alongside it, but - as has been remarked upon elsewhere: they do have a way with words around these parts. The car is making clanging noises all of a sudden and we have the strong suspicion that bits and pieces are falling off, but we drive on regardless. Rather than take the low road we prefer to take the high, which involves a slight detour along the old Duncrun Road. 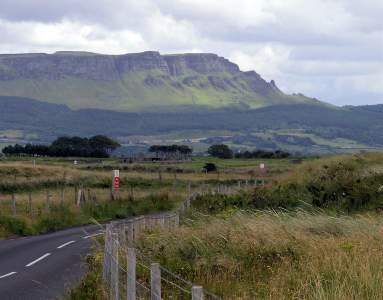 This hugs the foothills of Benevenagh and is a beautiful tree lined old fashioned lane which gives excellent views over both Magilligan and the Donegal mountains. Just now we drive past the bottom of our old friend, the Leighery Road, still desperately hanging on to that precious 'E'. mutters the road as we rush by. 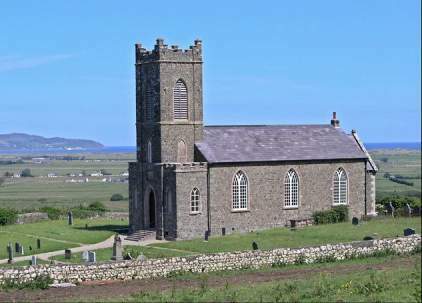 The first historic site we visit is Tamlaghtard Church which overlooks the coast and has a very interesting little graveyard. People from all over the world have come here to be buried. Admittedly most non-local graves belong to sailors who unexpectedly came to grief along the Irish coast in years gone by, but it is still a great honour to have them all assembled here. Further down the road is St Aiden's Church with its famous anti-wart well. We sprinkle some of the water over our car in the hope of a miraculous repair job, but it doesn't work. It's warts or nothing with that well! We enjoy the view and rejoin the coast road near the Heygate estate. Here we turn into Scotchtown Road and take a quick look at the Minearny Base Tower, which has been standing there for the last 150 years. It's a memorial to the first mapping survey of Ireland, which has been described elsewhere in this near endless collection of informative pages. Minutes later we clatter over the new Roe bridge and - after a few sharp bends - take the first turn right to head along Carrowclare Road towards the Sea Wall. Suddenly we hit an unexpected bump and one of our front wheels starts to wobble in a most amusing fashion. You've got to laugh, don't you, when you are out for a drive?! As we return to our rickety vehicle we see two of the birds dive down. A short struggle ensues and then they fly off with our windscreen wipers. They must be expecting rain on the way to Siberia. We shake our wise heads and drive off. What next? It's just as well that it never rains around here. 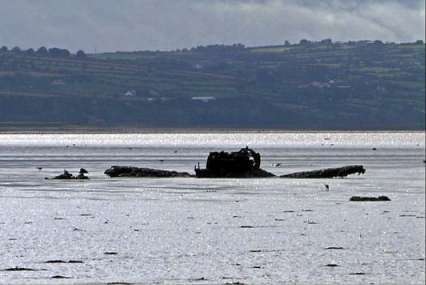 To reach our destination we have to clatter over an unguarded railway crossing and soon after we reach the sea wall - just opposite the ancient wreck of an American plane which was ditched with a burning engine on the mudflats of Lough Foyle back in September 1944. The old Corsair is a heart warming sight to us, because it's the only thing around here in even worse shape than our car. The pilot - a Mr. Schwenger - survived the ordeal. I sometimes think he never returned to the US of A but settled down in Limavady, married a nice local girl and their son now pilots gliders ...... badly! We turn right and drive along the road beside the dam. 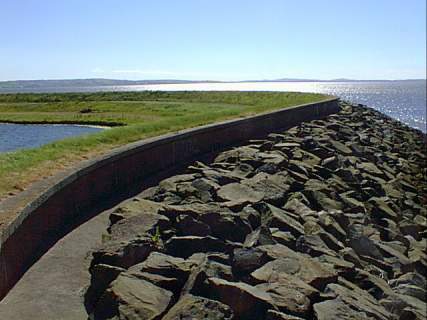 On one side is a deep channel which drains hundreds of acres of reclaimed land, on the other is the dam and the sea. It soon is time for another rest so we park our complaining vehicle on a slight slope and get out to give Tudor a well deserved walk. As I bang the door shut, the wobbly front wheel falls off and pirouettes into that bottomless sheugh, where it sinks without a trace. With our spare wheel somewhere in the Atlantic or the Irish Sea, it's going to be a long walk home! We promenade along the sea wall to calm our minds, drain the dog and plan the long march home. 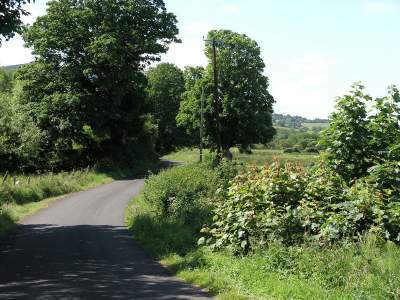 We examine the huge area of rich farm land around us closely, in case there is a shortcut to Limavady. 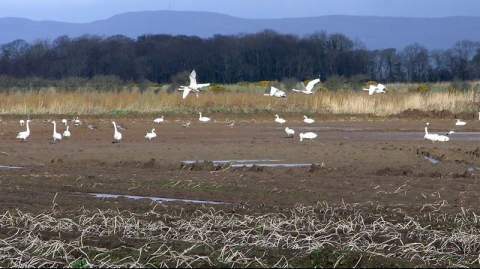 But all we see is grass and countless flocks of birds which use the area as a feeding and breeding ground. There are herons, gulls, swans hurrying towards Siberia and various ducks and geese. 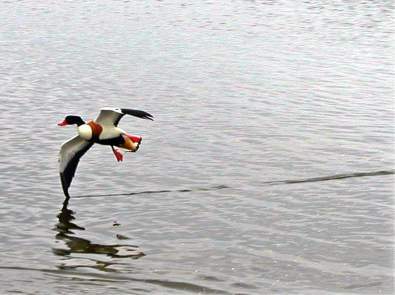 We notice a crazy Shelduck exhibiting some very strange behaviour. It circles above us screaming furiously, then skims the sea - flying very fast and very low. One can almost hear the brakes squeal. Meg shouts: "Duck." I yell back: "I know, its a shel d...." but am forced to do what I was trying to shout, because the animal is making straight for my head. I'm feeling shel-shocked , but luckily the duck misses my head entirely and continues its rapid flight towards the water, where it circles a familiar looking object peacefully floating towards the shore. This faithful hoop of rusty metal must have followed us all along the shore, hoping to return to its origins. I wade towards it - briefly disappear in an unexpected watery depression - and retrieve the welcome orb. A quick examination reveals it to be slightly wet; but apart from a recently acquired torpedo dent it looks perfectly serviceable. Something metallic hits our windscreen - followed by a few white feathers. The enraged duck must have collided with one of those quewick Buick boids! I get out and retrieve our long-lost windscreen wipers. They are twisted and really quite useless because the glass they were meant to keep clean is now shattered. We throw the twisted metal into the back and point the car towards Ballykelly.